I am always looking for new recipes to try out that will make my hectic mornings go a little easier. So, muffins are something that I like to make. They are quick to prepare, taste great and you can grab them and go! 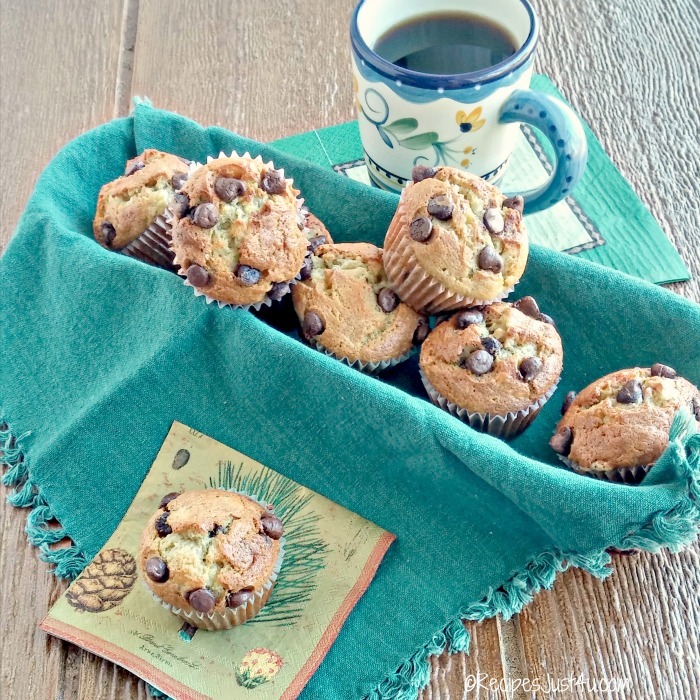 These banana chocolate chip muffins are my latest quick breakfast recipe and they are so hearty and delicious. 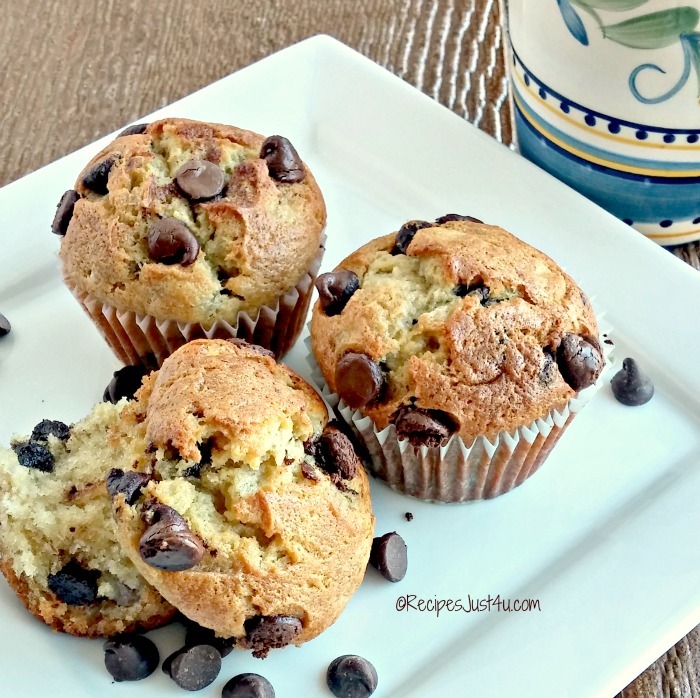 These banana chocolate chip muffins are a hearty and delicious quick breakfast. I always seem to have ripe bananas in my house. I use them all the time in cooking. They make a great low calorie ice cream. They are perfect in banana breads, and so I keep them on the counter all the time just waiting for them to get overly ripe..
That is the key ~ ripe bananas. This releases the sweetness in them and makes them perfect for baked goodies. 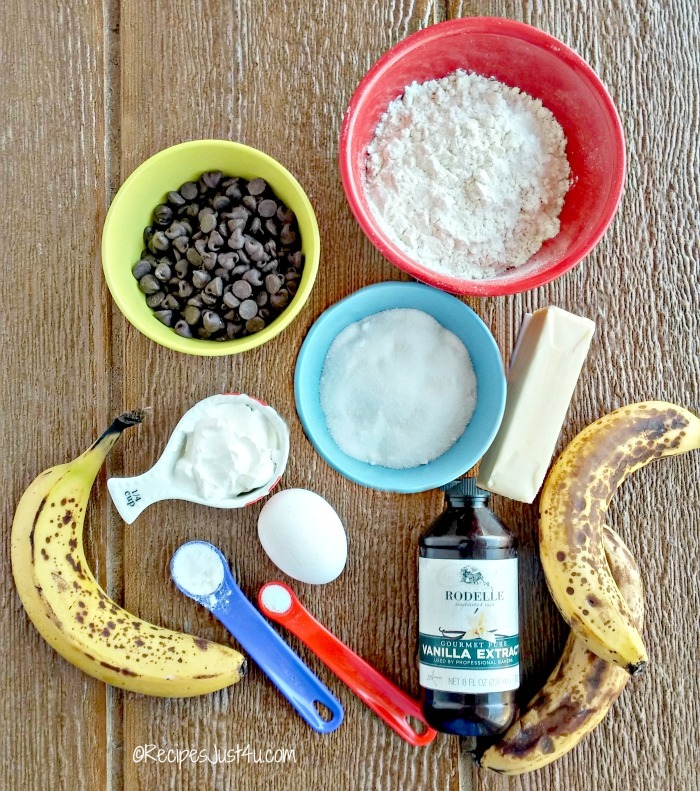 This is what will go into these delicious banana chocolate chip muffins. How can they not taste great? I started by combining my butter and sugar. Once that is well mixed, in go the mashed bananas and pure vanilla extract. 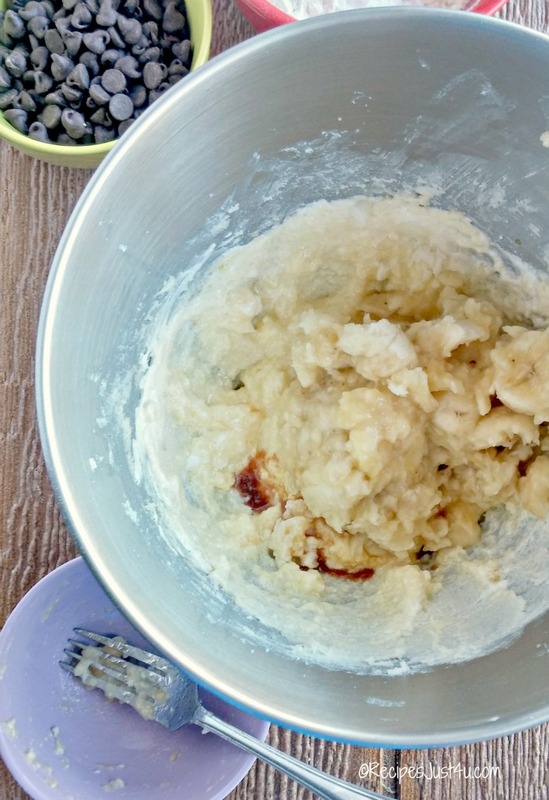 Don’t use imitation, you will want the flavor of pure vanilla in these muffins. Whisk your dry goods. This incorporates them and makes for a fluffier muffin too! This mixture gets added to the wet ingredients. Don’t mix it too much. You will end up with tough muffins if you do! Now fold in the semi sweet chocolate chips. Be sure to leave some to sprinkle over the top of the muffins too! This recipe makes 12 good sized muffins. I filled my paper muffin cups right to the top, after spraying them with some cooking spray so that they will release from the paper cups easily when done. Now it’s time to sprinkle the extra chocolate chips. This makes for a wonderful look to the muffin when they are baked! Into the oven for 25 minutes and then let them rest for a bit on a wire rack before serving. 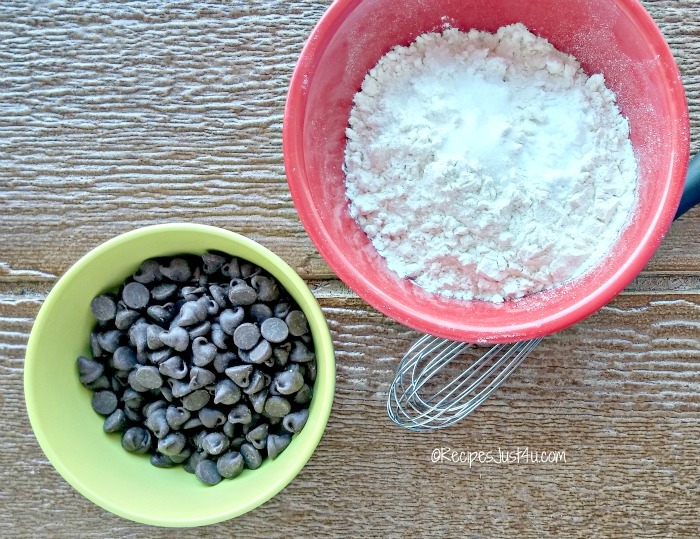 These banana chocolate chip muffins rose beautifully and make nice really plump muffins! 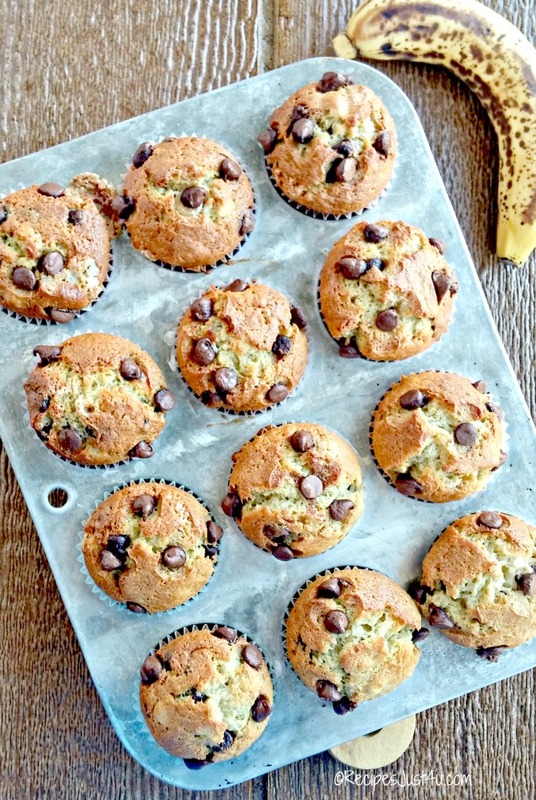 What could be quicker for breakfast than one of these tasty banana chocolate chip muffins and your morning coffee? 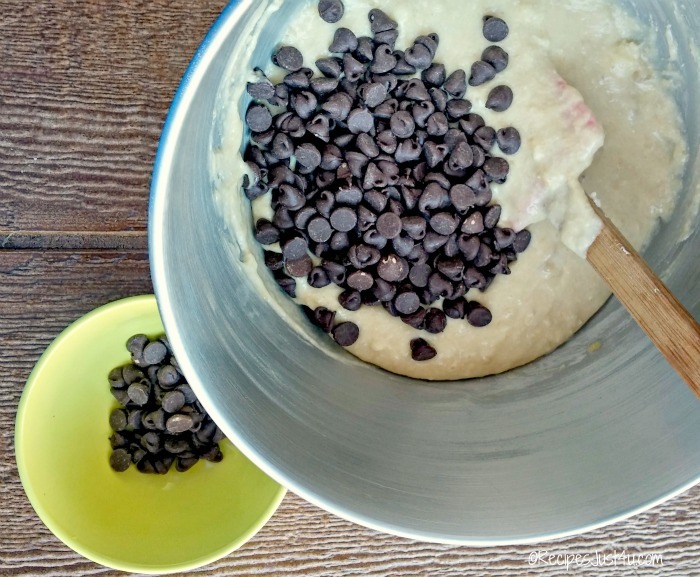 The banana chocolate chip muffins are moist, and plump and full of the sweetness of ripe bananas and that delicious chocolate. This is what I call a breakfast! I can’t wait to take a bite! These muffins also make a wonderful addition to a weekend morning brunch. Instead of coffee, why not have mimosas with them? Do you always seem to have ripe bananas in your house and don’t know what to do with them? See this post for some creative ideas. What is your favorite breakfast recipe for those hectic mornings when you need something on the table quickly? Tell us about it in the comments below! If you enjoyed this muffin recipes but can’t eat wheat or sugar, try these Paleo Banana Nut muffins. Preheat the oven to 350º F. Whisk together the flour, salt and baking soda and set aside. In the bowl of a stand mixer, combine the butter and sugar until smooth. Mix in the egg and then add the sour cream and mix well. Mix in the mashed bananas and pure vanilla extract. Whisk together the baking soda and flour and add it to the mixture. Fold in the chocolate chips, reserving some to sprinkle on the top. Line a muffin cup pan with 12 paper cups. Spray the insides of the liners with cooking spray. Fill the muffin cups to the top with the batter and sprinkle them with the left over chocolate chips. Bake for 25 minutes. They are done when the middle of the muffin is set and springs back when pressed. Remove from the pan and place on a wire rack to cool. Enjoy! When do you add the egg?? These are probably the best banana chocolate chip muffins I’ve ever made! I’ve made them twice in the last two weeks, and I had to double the batch this time (they’re in my oven right now! ), because they didn’t even last 48 hours in my house the first time around; my teenage sons devoured them! I did want to point out that your directions are missing a couple of steps. You don’t have when to add the eggs and sour cream, or the flour mixture. 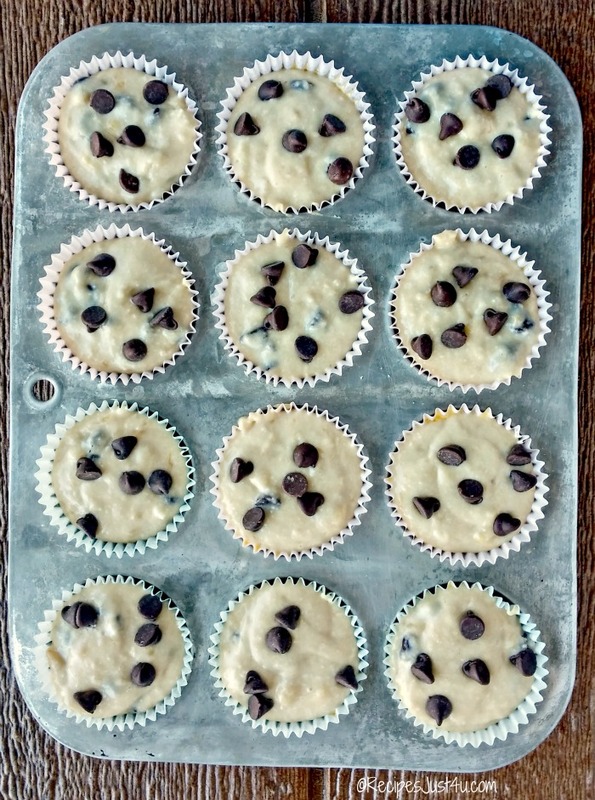 I’d hate for someone to try this recipe and have it not turn out because they didn’t notice the missing steps, because everyone should get to experience these yummy muffins! My pleasure Renee. My husband loved these! Carol, muffins are a favorite breakfast food for me too. Love this recipe and I will definitely try it out.